Helen and Susan Lunera LED replacement bulbs are now available at 1000Bulbs.com. Award-winning Helen and Susan LED replacement bulbs from Lunera are now available at 1000Bulbs.com. Unlike many commercial LED replacements, the Helen and Susan are plug-and-play solutions which work directly with existing ballasts, requiring no electrical rewiring or bypassing of the ballast. Customers can simply replace their old CFL or metal-halide bulbs by plugging in these new Lunera bulbs without further complication. 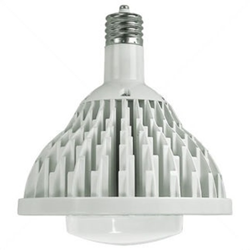 The Helen replaces CFLs with a G24d 2-pin or G24q 4-pin socket from 18 to 42 watts. Helen LED bulbs are available in color temperatures ranging from 2700K to 4000K and come in horizontal or vertical mount configurations for added versatility. Made to be tucked quietly away in recessed fixtures, The Helen is known for providing brilliant, natural light and energy savings of over 50%. The Helen was selected for the GSA Green Proving Ground program just last year in 2014; one of only nine selected technologies in a pool of over 120 applicants. The Susan replaces metal-halide bulbs with either a Mogul (E39) or Medium (E26) base. The E39-base LEDs are offered in horizontal and vertical mount options to replace 175, 250, 320, and 400-watt bulbs, and the E26-base LEDs are made to replace 50 through 175-watt bulbs. Select bulbs are available with an uplight feature that directs 15% of the lumens in an upward direction, making them ideal for use in acrylic or glass fixtures. Susan LED bulbs provide energy savings of up to 80% and deliver crisp, instant-on light. The Susan was accepted into the IES Progress Report 2014 for its uniqueness, innovation and significance to the lighting industry. All Lunera bulbs are rated to last 50,000 hours and come backed with a 5-year limited warranty. Based in Silicon Valley, Lunera is part of a community of progressive companies that challenge and reshape industries for the better. Lunera has won eleven awards since 2010, in large part because of the company’s BallastLED technology, which retains the benefits of LED technology in commercial buildings without requiring changes to existing lighting infrastructure. With the addition of these award-winning bulbs, 1000Bulbs.com is happy to strengthen its already substantial product offering.